The features discovered on the dwarf planet Ceres, which have puzzled astronomers no end, are continuing to reveal their secrets in the latest images taken by NASA’s Dawn spacecraft and published by the space agency. The photos were taken from about 240 miles as Dawn hovered over the mysterious dwarf between December 19 and 23. The Kupalo Crater was of particular interest, as it was captured with a resolution of 120 feet per pixel. The peculiar crater showed traces of bright material which had NASA stumped throughout 2015. It was eventually determined to be salt deposits, but the agency isn’t sure this is what they’re looking at here. The floor of the crater likely formed from impact melt and debris, NASA says. The monstrosity measures 16 miles across and was named after the Slavic god of vegetation and harvest. "This crater and its recently-formed deposits will be a prime target of study for the team as Dawn continues to explore Ceres in its final mapping phase," Dawn team member Paul Schenk said. Elsewhere, the gigantic 78-mile Dantu Crater dazzled with detail reminiscent of our Earth’s Moon’s Tycho crater. 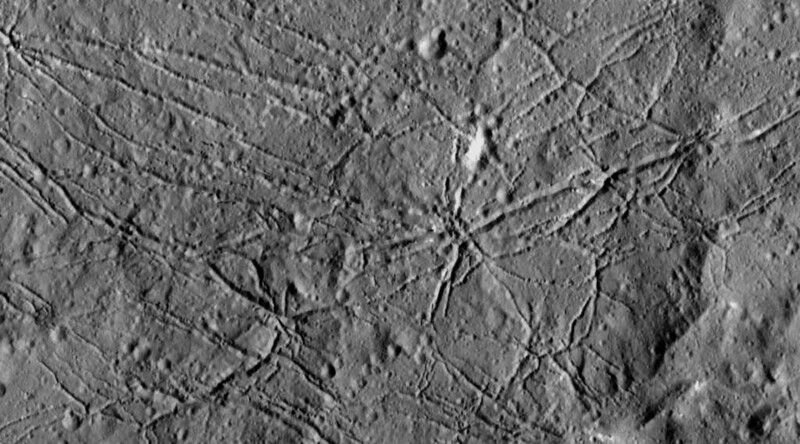 Meanwhile, another crater west of Dantu was determined to have collapsed in early planet formation stages, forming interesting ridges. Dawn’s other instruments brought in a wealth of information as well. The spacecraft will remain in orbit at its current altitude for the remainder of the mission, which is to last until June 30. "When we set sail for Ceres upon completing our Vesta exploration, we expected to be surprised by what we found on our next stop. 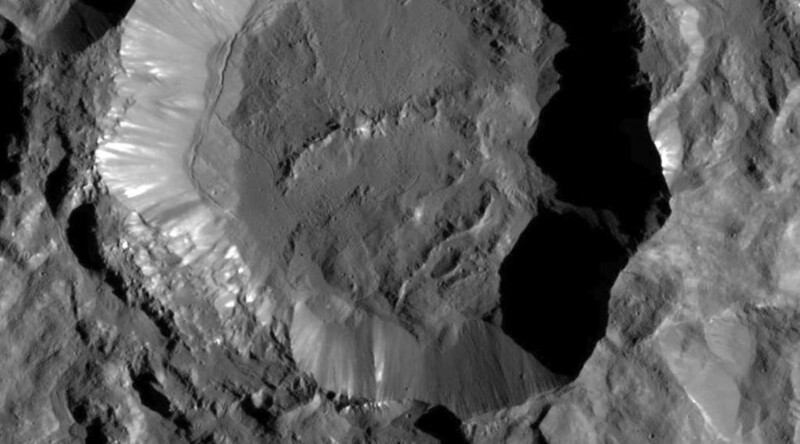 Ceres did not disappoint," said Chris Russell, principal investigator with Dawn. Dawn became NASA’s first mission to a dwarf planet, and the first outside our planet’s immediate neighborhood to manage a visit to two distinct targets in our solar system. It arrived at Ceres on March 6, 2015.